Description: A generally dark species, varying in color from almost black to brown to bluish. It has pale spots at the wing tips and brownish legs. The face is brown. This species is smaller than the very similar X. piceus (1). 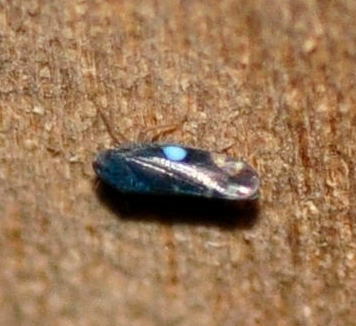 Adults are 3.0- 3.5 mm long. For additional pics of this species, see: BG. Distribution: A common and widespread species, recorded throughout eastern North America into the Midwest (BG). Habitats: Has been recorded in mixed hardwood forest habitats. Plant Associates: Taken on Willow and Black Locust (BG). Comment: This is the only member of this genus whose adults feed on trees (BG). Under the latest revision of the genus by Cwikla 1985, many species were synonymized under X. desertorum. While the following species appear to be visually distinctive, there are no differences in the male or female genitalia from desertorum, hence being synonymized. This move has not been carried out here as it seems necessary for further studies done to determine the validity of species within this genus. For now, species here will be differentiated based on visual characteristics. It is important to note though that these 'species' may not be valid, and visual characteristics that have been used to differentiate may not in fact hold up due to variation between forms and/or species. Furthermore, somes records may represent similiar species that are not yet on this site; obviously there is much to learn and revise regarding this genus. Furthermore, there is an apparent undescribed species that looks similar to X. superbus, but has a differently marked and colored frons, head and pronotum. Recent DNA barcoding revealed specimens of this 'species' cluster separately from everything else.